The Stables at Cefn Tilla Court in Llansenny, near Usk, Monmouthshire sleeps 6 people. Cefn Tilla Court near Usk is a renovated stable block which is part of the former Lord Raglan’s Grade II listed country estate. It is set in 120 acres of land with landscaped gardens and woodland filled with birds and wildlife. 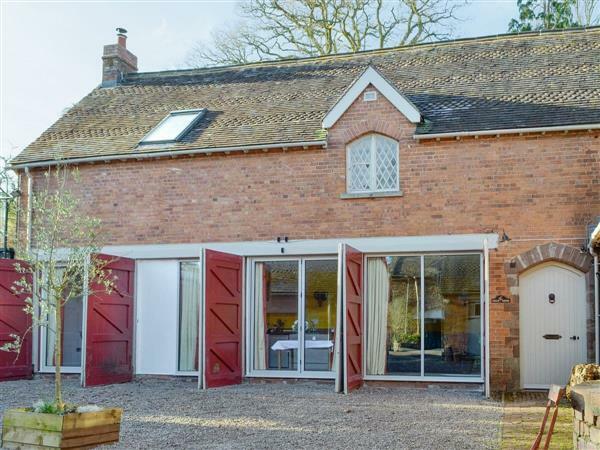 The Stables has been renovated to a high standard and offers ground floor accommodation, ramped access for those less mobile and a wet room adjoining one of the double bedrooms. Open plan living in this light and airy space thanks to the bi-folding doors and windows. It is a great property for extended families or group of friends. A luxury welcome pack is left for guests, along with toiletries for the bathrooms. However you decide to spend your time, this magical place will leave you with great memories. A variety of events can be arranged at Cefn Tilla Court, from clay pigeon shooting to horse riding (booked through the property office). You will find the shop 4 miles from Cefn Tilla Court near Usk, with the pub ½ mile and the restaurant is 1 mile from Cefn Tilla Court. The Stables can be booked together with The Courtyard (ref UK10333 [The Courtyard]), Cefn Tilla Hut (ref UK10336 [Cefn Tilla Hut]) and The Coach House (ref UK10337 [The Coach House]) to sleep up to 16 people. The Stables is all on the ground floor. Living area: With 32 Sky TV (basic package). Oil central heating, electricity, bed linen, towels and Wi-Fi included. Welcome pack. Utility room with washing machine (shared with other properties on-site). Large, lawned courtyard with patio, terrace and garden furniture (shared with other properties on-site). 120-acre landscaped and woodland grounds (shared with owner and other properties on-site). Private parking for 2 cars. Wheelchair access. No smoking. Please note: This property has a natural water supply from a spring. Holidays at The Stables, Cefn Tilla Court run from Saturday to Saturday. For a better idea of where Cefn Tilla Court - The Stables is, you can see Cefn Tilla Court - The Stables on the map below. Cefn Tilla Court - The Stables is in Gwent; should you be on the lookout for a special offer, you can find all the special offers in Gwent. It's always worth checking to see what is on offer at the moment. Do you want to holiday near Cefn Tilla Court - The Stables (UK10335), you can see other cottages within 25 miles of Cefn Tilla Court - The Stables; have a look to find your perfect holiday location.